In the monthly chart below you can see that the SPY ETF is close to breaking into new all-time highs again. But what will happen after that? This question cannot be answered using its own price action. As Elliott Wave Theory practitioners, we do understand that this is either the whole red wave V or alternatively, it is just wave ((1)) of wave V. If you use only the Theory, you will be left with no answer. 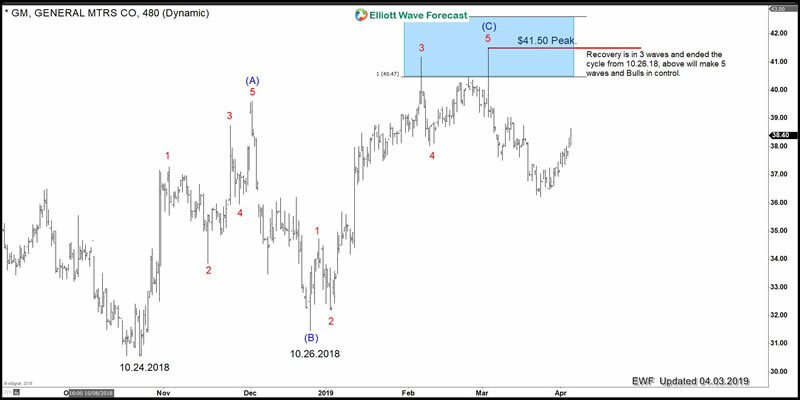 But as I said before, we at Elliott Wave Forecast use additional tools and we follow around 100 instruments on a Daily basis and relate them to each other. Today, we will be using General Motors stocks to track and decide which way the SPY ETF can go. In either case. It will extend within wave V or ends wave V. The following chart is showing the SPY ending wave V.
And the next chart is showing the second scenario. Which is showing SPY with an extended wave V.
At this moment in time, we can not tell which one of the 2 scenarios will be ending happening based on the Elliott Wave Theory. So we look for another instrument to peak the path with a higher probability. 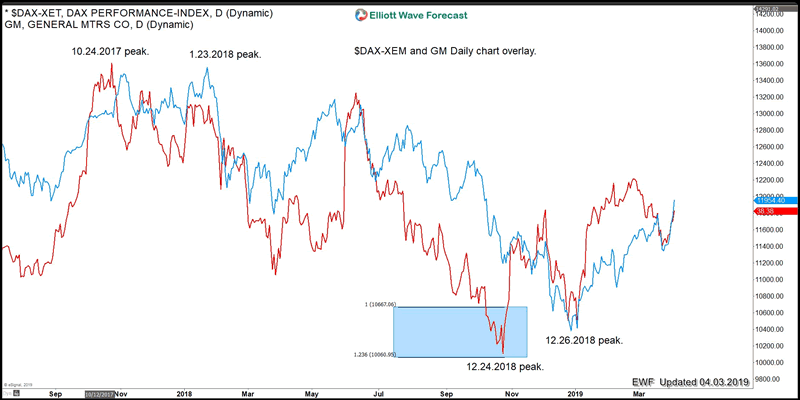 For that let’s relate the GM stock and the German DAX. The General Motors stock is always trading similar to other big World Indices. The chart above shows the relation of the DAX Index together with the GM stock. And it is easy to see that they trade overall in the same direction. However, one of the biggest differences is that GM bottomed first when it reached 100% equal legs from 10/24/17 peak at $30.56+ area. Also, we can see how the first pullback in GM ended at 12/26/18. And at that time we saw the low in the DAX and in other World Indices as well. Then both have been trading higher since that low. Then it became very interesting because of the following 3 observations. In our system, this is a huge and important observation. Because now GM will possibly dictate if the SPY ETF will extend within wave V or will end the wave V. With that said, it is now easy how to put this into the context. For that, we will have a look at the chart below. The chart is showing the price action in GM from 10/24/2018 lows. It shows our Blue Box area which comes at around $41.50 which is from its 10/24/18 low. The key is that GM needs to hold the peak at $41.50. If it breaks that peak clearly the Bears will lose control of the Market. The peak at 41.50 means that it ended a 3 waves advance structure. And a break above there will mean it becomes 5 waves from lows and consequently, more upside will be seen after a 3 waves pullback. This path would mean that the Bulls would be on the driver seat and that will translate that SPY will be ending only wave ((1)) of wave V.
But for now, we believe that as far as GM hold the peak at $41.50, sellers have the chance to make another run lower and create 7 swings lower across the World Indices. Then SPY will be ending wave V and consequently wave (III). 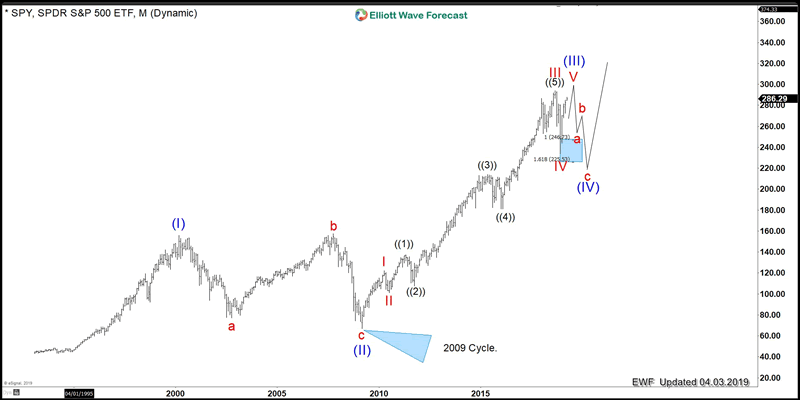 We at Elliott Wave Forecast understand that the Market cannot be forecasted based on one instrument and its price action. We have noticed that after years of practicing the Elliott Wave Theory. We knew that adjustments and other tools were needed to get an edge over the Market. We have learned that in the Market you always have more than one path. Therefore, relating other Instruments is key to determine the possible outcome.